We headed to Dublin today for the East Bay Regional Park District's and BART's "Tracks to Trails" event. 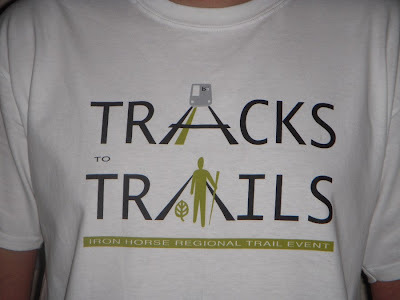 The event took place along the Iron Horse Regional Trail which is a multi-use trail running from Dublin, 24 miles all the way to Concord. Its a flat trail that is paved with plenty of room for everyone to share. Todays event was was to show how tracks connect to trails, and encourage just getting outside and out of your cars. 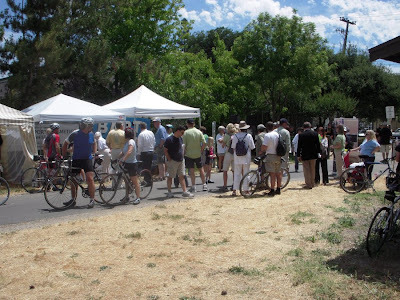 They had several energy stations along the trail where they were giving out water, energy bars, bike bells. We started our ride at the Dublin BART station, where they had their first energy station. We got a bike bell and began our ride. Weather was perfect for a ride and there were lots of people out riding, running and walking. We grabbed water and a cliff bar at the second stop near Bollinger Canyon. Our turn around point was in Danville, where they had their largest energy station and is almost the midpoint for the Iron Horse Trail. Arrived just in time to hear a few speakers from EBRPD and BART speak. They were also giving out some t-shirts, so thanks for that. We then swung by the farmers market across the street and headed back toward Dublin. The day turned out to be a great 20mile bike ride when all was done.